39 foot outboard powered Sharpie houseboat. I started out with a simple flat-bottomed sharpie hull. The advantages of a sharpie are mainly shallow draft and simple construction. There are numerous disadvantages, though. Sharpies pound in a head sea, and they have steering problems in some conditions. A long deep skeg will help solve some of the steering problems, but I wanted to retain the extreme shallow draft, so I used twin shallow skegs. 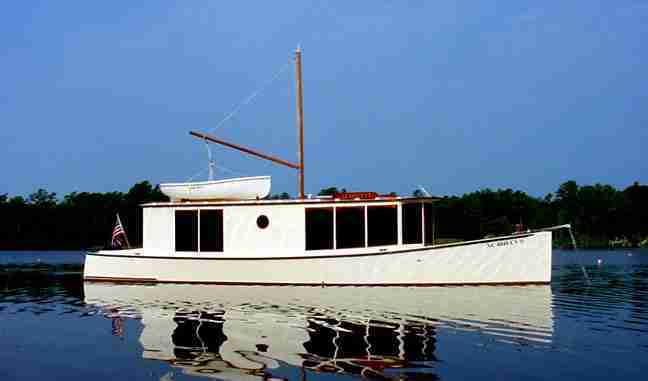 The most practical shape for this type of boat would be wall-sided (like Bolger's Sneakeasy design), but I decided that I would sacrafice some ease of construction for style. The bottom is 8' wide from about midships to the stern. The sides flare out from the bow toward midships, and then tumble home toward the stern, making a nice sweeping shearline. 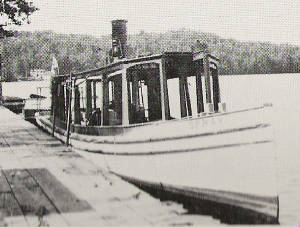 The cabin is a "street car" type, like the launches and water taxies of around 1900. There will be room on top for a nice 12' dinghy and plenty of solar panels. The mast will be easy to lower for bridges. The interior has at least 6'8" headroom throughout. Aft, there is a stateroom with a couch that converts to a 7' long double bed. Across from that is a large hanging locker and a desk. There is a large bookshelf forward of the bed, and also forward of the desk. 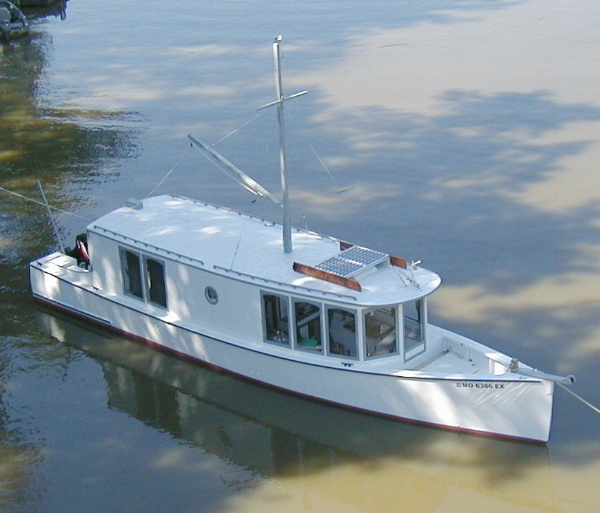 Midships is a 4' by 4' head, with a composting toilet. Forward, there is an 8' galley, with a 18" wide pantry with sliding shelves. 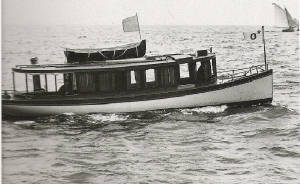 The forward cabin also has a drop-leaf table and a helm. There is enough floor space for a double air mattress for guests. There are numerous opening windows, and a door leading to the sunken fordeck. Forward is a large hold for a full-size bicycle, and self-bailing chain locker under the foredeck. 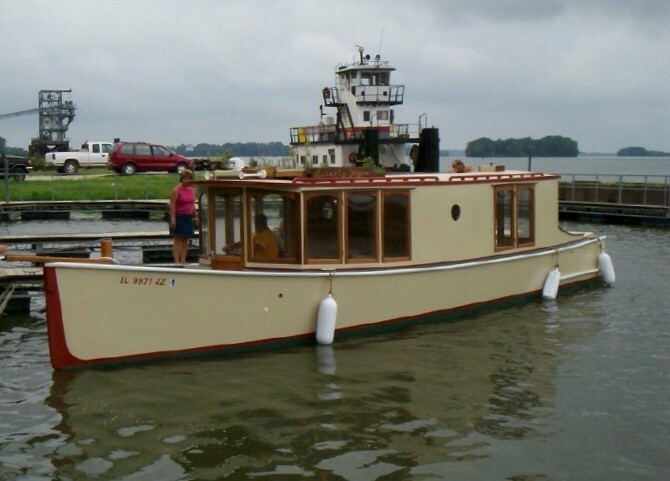 Aft is a cockpit and moterwell for the outboard, and two 25 gallon gas tanks. Storage for propane tanks is beside the motor well. Construction is mainly plywood and epoxy. The bottom is one layer of fir toungue-and-groove flooring (from an old house) followed by two layers of plywood to finish 2" thick. The fir flooring is varnished and serves as the cabin sole. The sides are two layers of 1/2" plywood. There are watertight bulkheads forward and aft of the cabin, and there are no underwater thru-hull fittings. It cruises at 8 knots with the Murcery 25 four stroke Bigfoot, at 4,500 rpm, which is 1,000 rpm below wide open. It cruises over 10 knots with a 50 hp motor. Click here for a photo journal of the construction. above is a few pictures of the style I'm trying to copy. 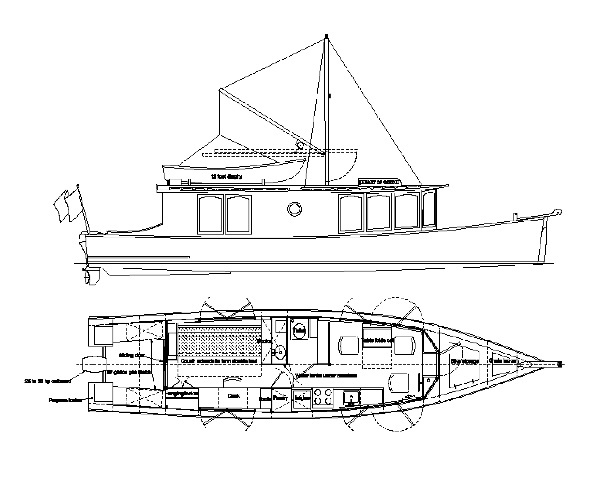 Plans consist of 18 drawings, 40 photos of boat being built, building hints and sources.